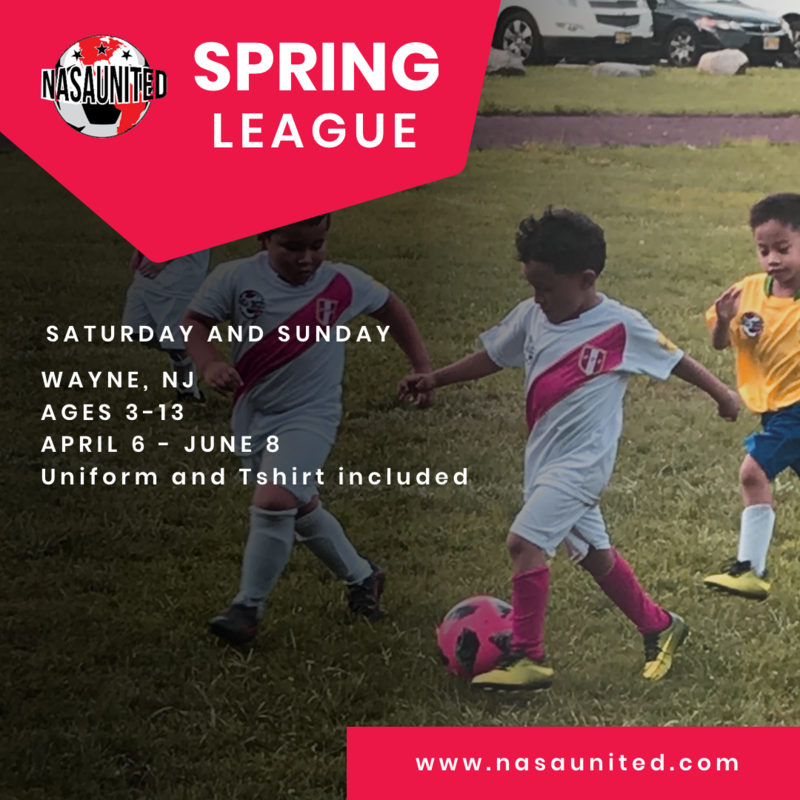 NASA United FC Tryouts for U7 - U19 Boys - 2019/2020 Season. Tryouts are open to dedicated players looking to play on premier level teams. Teams will train 3-4 days per week and have 2 trainers per team. All interested players MUST register online. Click below for details. #TBT to when former 03 NASA United player Juan "Zurdo" Gonzalez returned to train with his old team. He now plays with NY Red Bulls Academy and US Youth National teams. Keep working hard Zurdo, we are all proud of you! 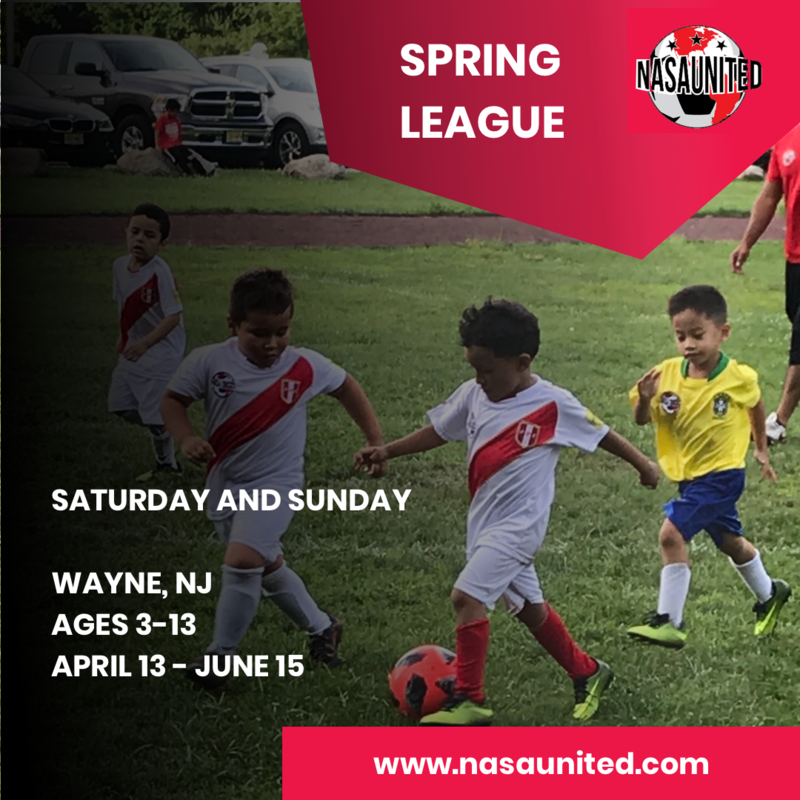 NASA Travel Team training schedules are posted for the Spring Season. Training will run from March - June. To access your team's schedule, click below. Print a copy for your records. 2001 Barcelona - Ironbound Spring Tournament champions. Great team effort on their way to a 1-0 victory over Ironbound SC in the final. 2003 Manchester United - Ironbound Spring Tournament champions. Undefeated 4-0 record on their way to victory in the finals over Jersey Crew. 2005 AC Milan indoor tournament champions at Turf City. Well done boys! For more info and details on joining the team, click below link. 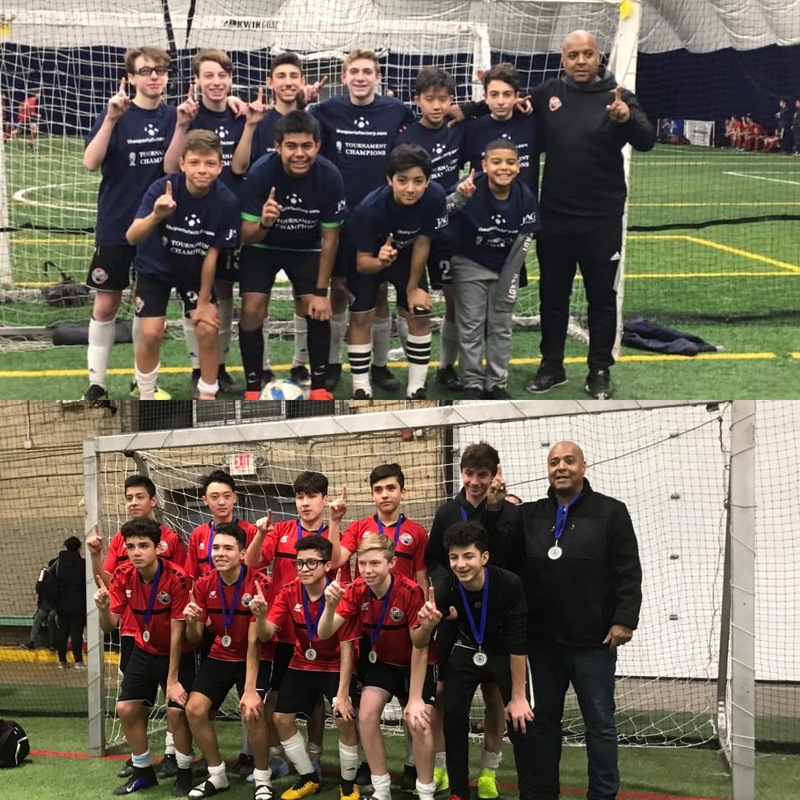 NASA United Boca Jrs 2004 and Manchester United 2003 Indoor Champions this past weekend. Nice job, keep working hard boys! For more info, click below link. 2018 was a year full of growth for NASA. 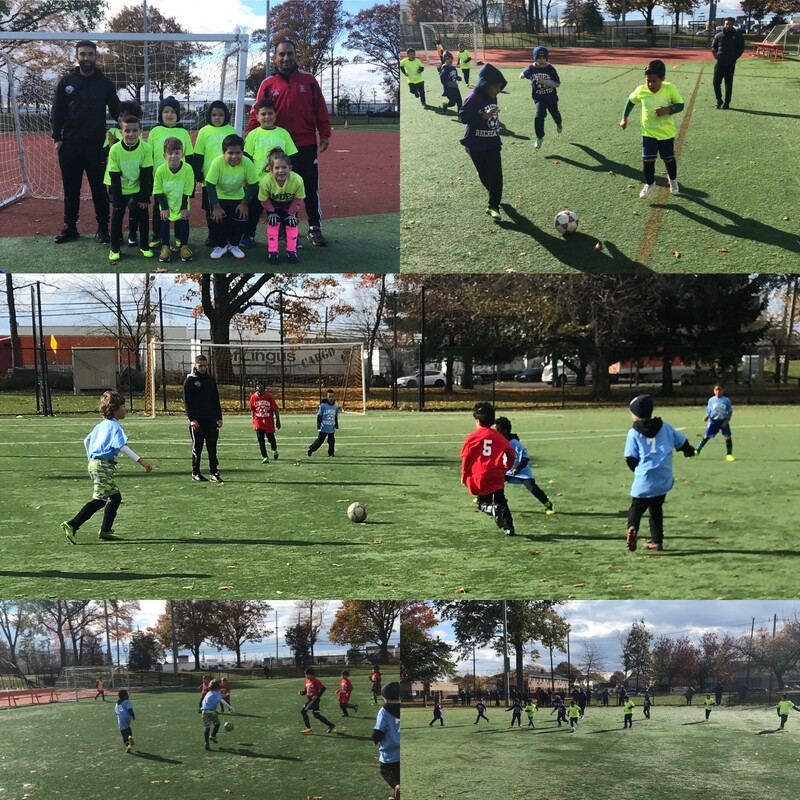 We made donations to orphanages, competed for State Championships, traveled to prestigious tournaments in Canada and Europe and affiliated with the NY Red Bulls. The future is bright, looking forward to 2019! NASA would like to wish everyone a Merry Christmas and a Happy New Year! NASA United making donations at the annual Christmas event for @ourwaytohope in Paterson, NJ. 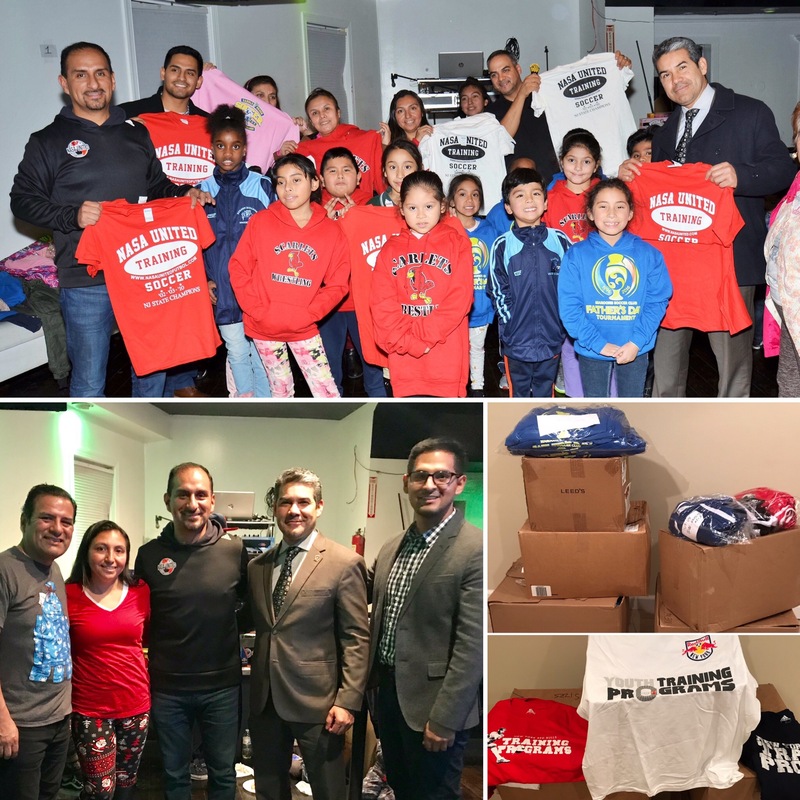 With the help of many, including @newyorkredbulls, we were able to give away Free uniforms, sweat tops, jackets and other supplies to over 75 families. NY Red Bulls NASA Fall RDS was an incredible experience. Thank you @newyorkredbulls, Gareth Tyack - NY Red Bulls Manager RDS and the rest of the RDS staff. Looking forward to hosting the NASA Spring RDS. Winter Indoor Training for 2018-2019 is open for registration. Training will run from Dec-March and is open for boys and girls ages 6-13. The Winter Indoor Program will utilize the advantages of Turf City to help improve a player's overall soccer ability (dribbling, passing & shooting). Turf City offers 2 state-of-the-art indoor turf fields, surrounded by walls which allows for non-stop, off-the-boards, fast paced action. Click below for details. NASA Travel Team training schedules are posted for the Winter 2018/2019 Season. Training will run from December - March. To access your team's schedule, click below. Print a copy for your records. NASA United wishes everyone a safe and Happy Thanksgiving! NASA United together with Linden Recreation running the Linden Fall League. Congrats to all players on a wonderful season! Click below for more info. 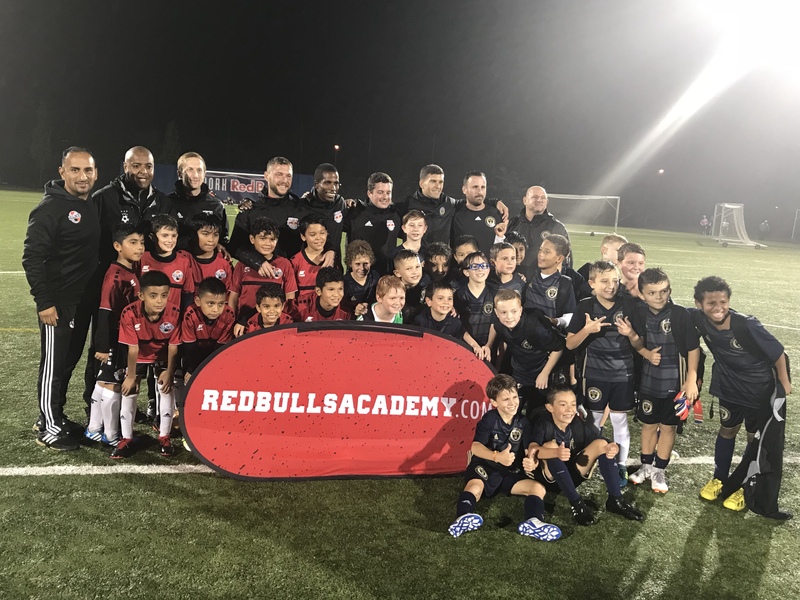 NASA was invited to the NY Red Bulls invitational tournament with the Philadelphia Union 2009’s. 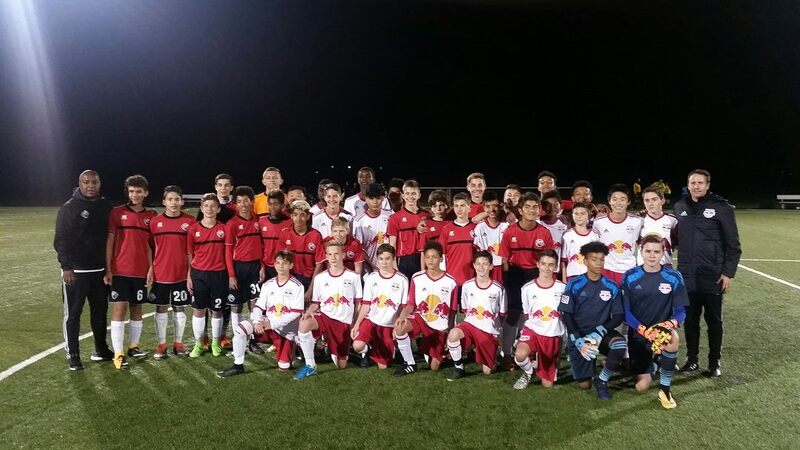 Great experience for our boys against top MLS academy competition. NASA 2010 boys with an excellent performance against Montclair United, Cedar Stars and STA at the Parsippany Pride Tournament. Thank you to all participants. NASA players are now ready for the RDS season! To join NASA and become part of our Free NY Red Bulls 2019 Spring RDS season, click below or visit the RDS page. 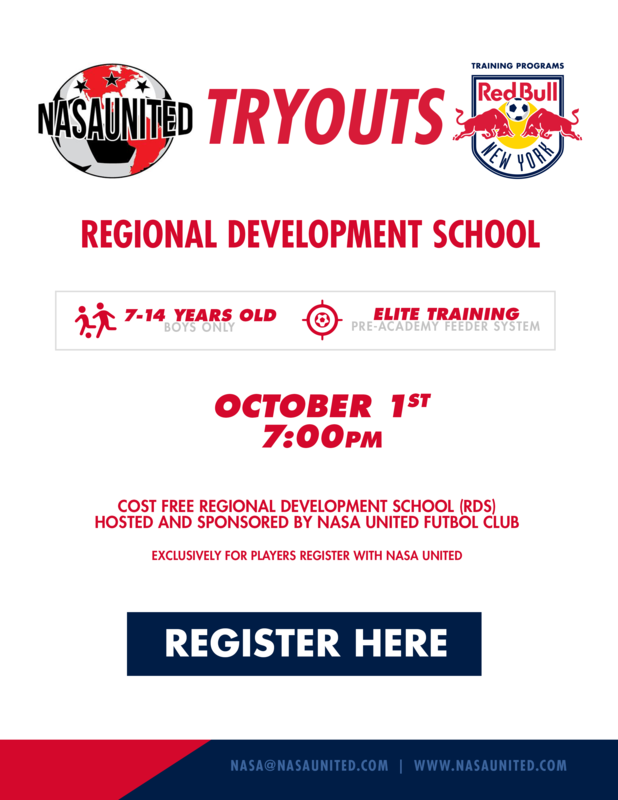 NASA United FC is pleased to announce the start of the New York Red Bulls RDS program for the upcoming Fall Season. Through our recent partnership with NY Red Bulls, RDS will be FREE for the full year (Fall and Spring) for all players registered with NASA. 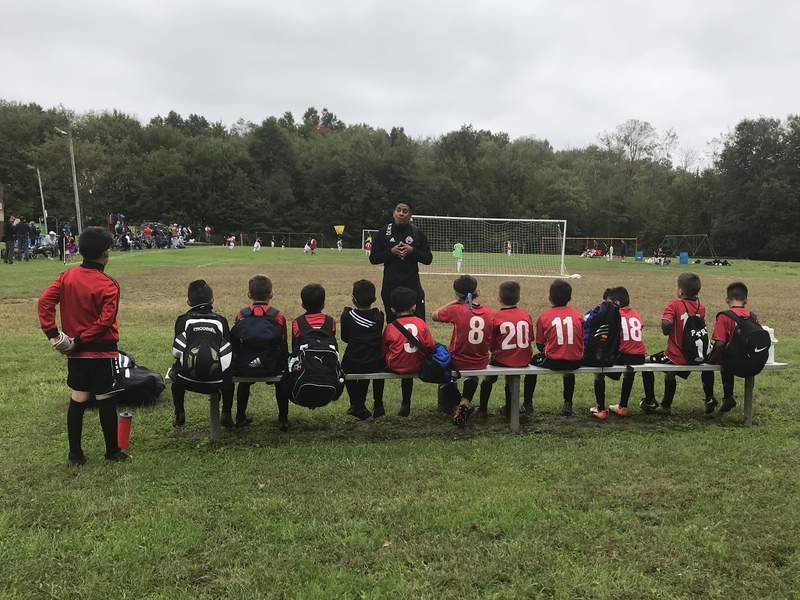 Another exciting season of Fall League soccer has arrived! Practices will begin this weekend. Registration is still open. Spots are filling up fast in all divisions, click below for more information. Fall League registration is still open. Open to players ages 3-13 (born 2015-2005). The first practice of the season will begin this Saturday, 9/15. Spots are filling up fast, click below for more information.